A chateau in France - the ultimate dream? To own a genuine French chateau, is, of course, the ultimate dream for many of the Francophile Brits who decide to move across the channel to begin a new life in La Belle France (Life in France). 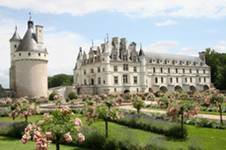 Impossibly romantic, French chateaux are brim-full of history, spacious and elegant. They usually occupy a prime location and (here comes the good bit) are surprisingly numerous and available for purchase. Prices range from the heady levels that would set a billionaire's heart a flutter down to a paltry few hundred thousand Euros... less, in fact, than many a semi-detached house can cost in England. It's the ultimate status symbol, it's the ultimate romantic dream, but is it also the ultimate folly? There are two main reasons for the existence of chateaux in France. Firstly, as is fairly obvious when you see the elaborate fortifications that exist on many mediaeval chateaux, they were built to withstand attack, and to provide a place of safety. The Middle Ages were a time of terrible wars, religious crusades and savagery, and there was a very strong need to have a fortified home or building where those of sufficient importance could shelter and mount a counter attack in relative safety. The second reason for the existence of a chateau was to provide a worthy residence for the wealthy and noble population of France. Particularly in the Renaissance period, wonderful opulent castles sprang up all over the country to house those who could afford the lifestyle, and whose titles decreed that they should live in style. Chateaux were created to be the hunting lodges of kings and princes, the dwelling places of the aristocracy, and, finally, the residences of wealthy merchants, who were the early equivalent of the "nouveau riche" class of today! It is also interesting to note that many of the best chateaux were commandeered by the Nazi commanding officers during the occupation of France in the second world war, and traces of these occupations can be seen in many today. What makes a house a chateau in France? There are so many different types and styles of chateaux to be found in France that it is quite difficult to tell what the actual definition of a chateau is, though the literal translation is of course, castle or mansion. France certainly has some grand and elegant houses that are perhaps not best defined as chateaux, although there are some who claim that any house which is large, grandly proportioned and set in good grounds is, by right, a chateau. Who is correct? It is, perhaps, impossible to know where to draw the line, as there are so many interpretations given and accepted. A chateau can be the most magnificent of fairy tale castles, with soaring towers and witches' hat turrets, or a relatively plain but large country house, perhaps created as the main residence of an affluent farmer, or a vineyard owner's home (French properties with vineyards). If the cap fits, let the chateau wear it. French chateau for sale - who might be the owners now? If the chateaux of France were created to be the residences of rich and noble Frenchmen, who lives in them today? A lot of them are, or course, sadly lying in ruins, although they are still well worth a visit as their history is fascinating. Many, however, not only survive, but also still serve as full-time homes for a surprising number of people. Some chateaux are still owned by the old aristocratic families who have passed them down through the generations, and who take immense pride in preserving their own piece of French history. A chateau seemingly exerts an irresistible draw on ex-pat house hunters in France. Not just the Brits, but the Dutch, the Germans, the Americans and probably many other nationalities as well, are all fascinated by the chance to own and live in one of these great symbols of France. Those with money to burn can purchase a fully renovated and superbly appointed chateau, presumably along with the staff required to run it. And for around £1,300,000 (1,900,000 Euros) you can be the proud owner of a magnificent fifteen bedroom palace, with hectares of Capability Brown style park and a swimming pool that Posh and Becks would envy. But what of the rest of us, who are not quite in the super rich bracket? Is owning a chateau in France an impossible dream? The answer, perhaps, surprisingly for those of us who are used to the overheated and prohibitively expensive housing market in the UK, is not at all. Anyone who has sold an ordinary detached house in the south of England, probably for around £4/500,000, for example, should easily be able to find a chateau, renovated to a liveable standard, within their budget, and leave a hundred thousand Euros or so for further renovation or a rainy day! This "middle" price bracket of chateaux is perhaps the most competitive, though, as there are quite a lot of ex-pats who are able to afford these properties and who are prepared to ruthlessly pursue the dream of owning one. It seems inconceivable, but those on a pretty limited budget may also be able to fulfil the dream and buy their very own chateau... though it is almost certain that there will be a lot of hard work ahead. You have to know where to look, and they don't pop up in every estate agents brochure but it is possible to buy a chateau for less than 300,000 Euros. For this sort of cash you know there will be work involved, but a place of this type may well be just about habitable, if you don't mind huddling around smoky old log fire to keep warm in the winter! It does mean, however, that an enviable piece of French history could be more affordable than you thought. The majority of ex-pat chateau buyers, though, find themselves with a property that needs careful restoration rather than a complete re-build (Building or extending property in France). Geoffrey Kenyon-May, an Englishman who has made his life in France from being a young man, is well qualified to advise, as he has bought and renovated no less than six chateaux to date! Geoff's advice to anyone finding themselves in this position, or considering it, is to go ahead, because the sense of satisfaction when you step back and look at your finished chateau is worth it's weight in gold, especially when you add to that the fact that you will then be the owner of a truly unique and historically important piece of real French character. He also cautions, however, that you need to be dedicated. Renovating a chateau is not for the faint-hearted, and if money is an issue you will have to be prepared to do it the hard way... yourself! Geoff says he "lived in demolition yards" for years, searching not only for cheap materials with which to restore these crumbling piles to their former glory, but also to ensure that the materials he used were authentic and sympathetic to the region. Camp out in the place before you start, if necessary, to get feel for the soul of the property, and to develop a clear vision of what you really want to do. Look around the area at any other chateaux, talk to locals (if your French is good enough) to find out what the place used to be like, if they can remember it in a better condition. Chateau renovation may surprise you! Be prepared for some surprises too... Geoff says that during his renovations he has variously discovered a murder victim whose body had been dumped in a sand quarry beside his chateau, a Nazi torture/interrogation chamber and some amazing (if somewhat creepy) original artefacts such as a genuine executioner's block and axe! This now stands beside his front door, although I am not sure that I could live with that! Sympathetically and painstakingly restored, the chateau is both elegant and also, essentially, a real family home for the couple and their three sons. For the de la Panouses, the key word for their restoration has been respect. Respect for the house, for its grounds, the environment and its traditions and history has helped them to restore and preserve an important and lovely piece of French history which could otherwise have been lost or spoiled. The bed and breakfast enterprise was conceived partly to help offset the cost of running and maintaining such a house, but also as a way of sharing this special place with the rest of the world. The chateau and its history can be seen on http://www.chateausaintmichel.com/. 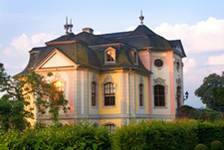 It would be naive, perhaps, to imagine that you can make a purchase of a building like an old chateau in France and not encounter a few pitfalls and problems. These can vary in magnitude, of course, from the relatively simple to rectify to the almost impossible. Build in extra time to your renovation schedule to cope with setbacks, and be prepared to be a little flexible in your approach. If you are experiencing difficulty in finding the appropriate materials for your renovation, follow Geoff's advice and pay a visit to a local demolition yard, or even get down to a "Vide Grenier" or the eponymous Emmaus sales where you may be pleasantly surprised at the discovery of an occasional jewel among the rubble (Second hand France)! The de la Panouse family were forced to take a creative approach when trying to source a quality wallpaper with the right feel for their guest bedrooms. They eventually discovered a paper with the right authentic French feel... at a Laura Ashley shop on a visit to England! There can however be greater problems in store for the unwary. It is important to be realistic about what you can afford to do. There are a lot of impoverished ex-pats shivering with cold in draughty French chateaux, trying in vain to restore their voluminous properties and despairing of ever being able to do so due to a rapidly decreasing bank balance. There can be other difficulties too. If something goes wrong, as it did quite disastrously for the Ferrer-Fort family of the Château Belcastel in the Tarn (Tarn Property Guide), a lack of adequate insurance can be a complete nightmare. A chimney fire that spread to the roof effectively wrecked the top three floors of this once graceful chateau, one of the biggest and most beautiful in the region. With a property of this size and grandeur, the restoration costs are immense, and without several million Euros at their disposal it is unlikely that the family will be able to return their pride and joy to its original state. Not only this, but the property is likely to continue to decay without the necessary work to re-weatherproof the roof and restore the essential timbers for the floors of the upper storeys. The rewards of chateau owning are great, but so can be the problems... and if you have a disaster, it is likely to be a big one. And if you still want a chateau in France? If after all this, you still think that a chateau is the future home for you, then go ahead and start your search. Be realistic about what you can afford, but have plenty of optimism too. Living in a French chateau is, perhaps, if not just for the wealthy, only for the brave or the foolhardy, but it is, indisputably, a wonderful dream that can be realised. Once restored, your piece of history can be turned into a money spinner if you wish, with the options of restaurants, hotels, Chambres d'Hôtes, a venue for special events and even museums presenting themselves. Once you get this far, the only limit is your imagination!